Bananas are a great source of fiber, as well as potassium, vitamins, and minerals; plus, they are also good for the heart. This recipe is excellent for a quick breakfast or a snack. 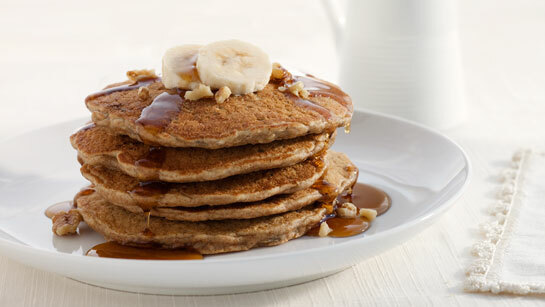 Since bananas are naturally sweet, you can enjoy this dish without the guilt of consuming too much sugar. Place your melted butter in a bowl and add salt and milk. Mix well. Mash banana and fold it into the mixture. Put in your flour and baking powder and mix well. Heat your pan or skillet for 1 minute in low heat. Brush it with some oil or butter, then pour in a scoop of the batter into the pan and cover. Cook pancakes for one minute or until sides are slightly separating from the pan. Flip and cook for another minute or two. Serve on its own or garnish with your favorite natural sweetener and top with some fresh berries.